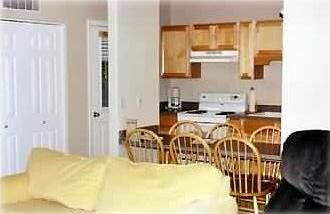 Vacation Condo at Sunriver ! Powder Village unit K-5 is a bottom-floor, two bedroom, two bath, Non-Smoking condo located just a short bike ride or drive to the Village Mall where shopping and restaurants are located as well as bike and ski rentals. The condo is 875 square feet, has nine foot ceilings, is heated by electric forced air, and was built in 1999. The two bedrooms, both with king-size beds, are nicely separated for privacy with the living and dining area located between them. There is an outdoor swimming pool (seasonal) and Hot Tub (open year round) located onsite. Sunriver has 30+ miles of bike trails for your enjoyment. Only 18 miles to Mount Bachelor Ski Resort. Just a 15 miles to Bend where there are a multitude of restaurants and shopping options. Clean, comfortable and 25 minutes away from the ski slopes. I'd stay here again. We had a great time. The condo, although not fancy, served our needs. I do recommend bringing any spices you need to season your food. The condo had salt and that was about it. We brought our own anyway, not knowing what would be there. We had everything we needed to fix meals, shower, and sleep. Had a great time and the price was reasonable. The area was very quiet and we all slept well. Nice to have 2 full bathrooms. Due to the aspect the condo gets a little warm on a hot summer day, but the grounds were quiet and it was a nice place to relax in the evenings. Condo was very nice ....we enjoyed our stay very much !!! Owner was excellent to work with. We were very happy with our stay a few weekends ago on a ski trip. The location is perfect, you can avoid all the Sunriver traffic on your way up to Mt. Bachelor. The condo was clean, comfortable and the perfect size for a family. The beds are clean and comfortable. The living area is very cozy and comfortable too. The kitchen may be a little small if you want to cook big meals but it had everything we needed. There is no dining area, so it can be a little congested at dinner. I really appreciated the fact that unlike other condos, they didn't make us do all the cleaning when we left! All in all, it was a wonderful place, and we'll definitely be back! We had a great time and wished we could stay longer. The only thing I would say is that the bed in the second bedroom was much more comfortable than the bed in the master so we gave the master to my daughter and took the spare bedroom for the comfy bed. I would switch those beds around! The place was great and had just about everything we needed. Only thing we needed that the place didn't have was scissors and matches because the auto lighter on the bbq didn't work. I would love to stay here again and will keep it at the top of my list for my next visit to Sun River. Thank you! 9% room tax applied to all rentals. $50.00 clean fee applied to all rentals. No pets allowed. The entire Powder village condo property is now NON-SMOKING. You will need to go to edge of property to smoke if you wish to.